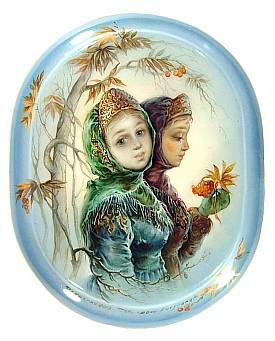 The chill of winter has come and two girls stand outside near the small tree, one of them holding a twig and small amount of ashberries in her hand. The girls have wistful looks in their eyes, perhaps not quite ready for the long winter, but knowing that some things are inevitable. 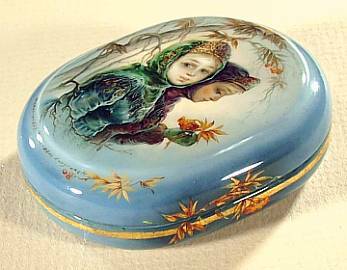 This box is quite small and painted with fine details and in the endearing style of Fedoskino artist Margarita Pichugina. 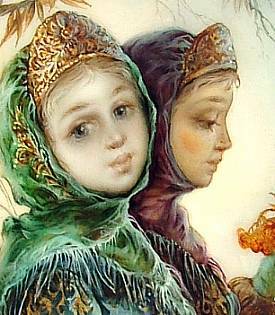 There is an inlay of mother of pearl in the girl that is looking toward us. Its beautiful iridescence seems to balance the otherwise melancholy tone of the piece. The base color of the work is a soft blue. On the sides there is a simple gold ornament which is adorned at one end with a small branch from the ashberry tree. The box is made out of high quality papier mache and has a hinged the left and a red interior. It is signed with the name of the artist, village and year.